The Royals' streak of five seasons with at least 80 wins ended as they finished last in the American League Central at 58-104 after a mass exodus of homegrown talent in the offseason. Kansas City may boast only one top-100 prospect in 2018 first-round pick Brady Singer, but the system saw slight improvement in winning percentage, up from .463 (26th out of 30 organizations) in 2017 to .483 (20th). Seuly Matias was the early headliner with a breakout year as the team's third-ranked prospect went deep twice in the season opener and homered four times in his first three games. No. 2 prospect Khalil Lee reached Double-A Northwest Arkansas days after his 20th birthday and both Frank Schwindel and seventh-ranked Nicky Lopez performed well at Triple-A Omaha and are on the cusp of reaching the Majors. The system may not be loaded with top-level talent, but the Royals are fully focused on rebuilding with an eye toward the future, one that may include several of the players below. Catcher -- MJ Melendez, Lexington (111 games): Making his full-season debut at Class A after the Royals selected him in the second round of the 2017 Draft, Melendez got off to a hot start and batted .275/.331/.577 through the end of May, blasting eight homers and driving in 28 runs in 39 games. He finished third in the South Atlantic League with nine triples and fifth with 19 long balls and a .492 slugging percentage as a 19-year-old. The Royals' fifth-ranked prospect is also advanced behind the plate, throwing out 26 of 62 baserunners and tying Lakewood's Rodolfo Duran for the best caught stealing rate on the circuit at 41.9 percent. "He's our best catching prospect, a complete player," Royals vice president and assistant general manager of player personnel J.J. Picollo said. "He's got exceptionally high hard-hit rates and drives the ball to all fields; offensively, we think he's ahead of where we thought he'd be a year ago. Defensively, he made unbelievable strides, not so much physical but mental -- calling the game, relationship with pitchers, being a leader -- the intangible things you hope come along with time." First baseman -- Frank Schwindel, Omaha (134 games): An unheralded 18th-round pick out of St. John's in 2013, Schwindel is a name Royals fans need to know. The 26-year-old tied for fourth in the Pacific Coast League with 93 RBIs and tied for seventh with a career-high 24 homers and a .286/.336/.506 slash line, building off a strong performance after his initial promotion to Triple-A Omaha early in 2017. It took the former catcher a year and a half to master Double-A pitching while learning a new position, but he hit the ground running much faster with the Storm Chasers and more than doubled his walk rate from last season to 6.1 percent. "Frank keeps hitting. He's kind of been a very interesting player for us because you keep waiting for the shoe to fall and it didn't; his production keeps getting better," Picollo said. "He's taking more professional at-bats, walk rate up significantly and still driving the ball. When the pitcher makes a mistake, he's probably going to drive it somewhere. He keeps coming along with the bat and works hard at first base. He's improved there as well." Second baseman -- Nathan Eaton, Idaho Falls (66 games): Eaton may have been too advanced for the Rookie-level Pioneer League, but he dominated it all the same, sharing the lead with 59 runs scored and ranking second with 19 stolen bases and a 1.008 OPS. The Royals already are looking to increase the 21-year-old's defensive versatility in the mold of one of their current big league stalwarts. "He's extremely athletic and can really throw; [he has an] 80 arm across the infield," Picollo said. "We had a hard time profiling where he best fits. We played him in center field just to see him run around and he did work in instructional league. We think he'll have a chance to do what [Royals second baseman [Whit] Merrifield does with us, playing around the field. We're all anxious to see where this goes with him because of his tools." Third baseman -- Jecksson Flores, Northwest Arkansas (122 games): Flores has bounced around the infield over the past three seasons. He played mostly third base at Class A Lexington in 2016, was primarily a shortstop at Class A Advanced Wilmington in 2017 and played more games at second base (44) than third (40) or short (22) with Northwest Arkansas this season. While his versatility adds value, Flores enjoyed a breakout season with the bat at age 24, winning the Texas League batting title and setting career highs by hitting .314/.363/.440 with seven homers, 27 steals, 74 runs scored and 52 RBIs. "Every year, he just keeps answering the bell," Picollo said. "He doesn't project as a third baseman. He's a little guy, lacks power, more of a utility guy -- he handles shortstop well, played him in left field and plays third base and second base. Offensively, he hits a lot of balls hard and on the nose and doesn't give away at-bats. To win a batting title, you've got to be consistent throughout the year, and he did that." Shortstop -- Nicky Lopez, Northwest Arkansas (73 games), Omaha (57 games): Lopez put his 2017 struggles at Double-A behind him in a big way, batting .363/.397/.473 in 51 games from May 1 until he was promoted to Triple-A in late June. The Royals' No. 7 prospect hit seven homers in 57 games with the Storm Chasers after blasting two in 73 games with the Naturals and drew 27 walks compared to 29 strikeouts while committing five errors in 130 games. "I think of Nicky and I think of consistency -- his at-bats, his defense, his baserunning," Picollo said. "He's the same guy every day. Doesn't strike out, walks, field general on the field. As much as a guy can be ahead of his Draft class, he's one of those guys. His first experience in Triple-A was positive and we look forward to him helping the big league team in the near future." 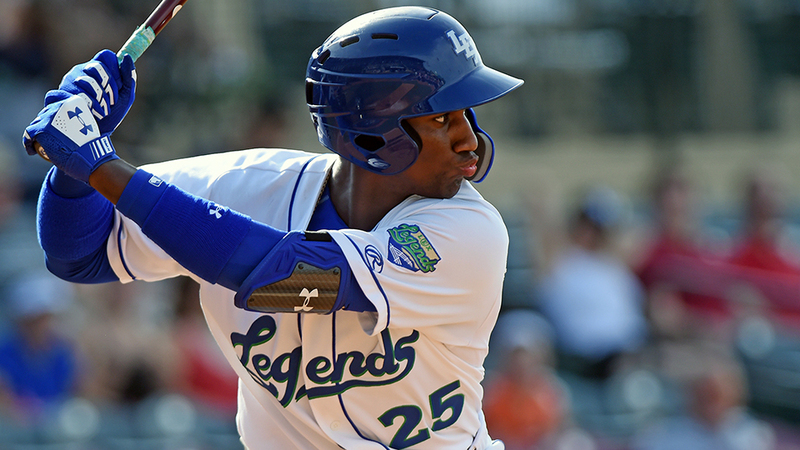 Seuly Matias, Lexington (94 games): If it weren't for Asheville's Casey Golden and several weeks of missed games, Matias might have led the South Atlantic League in home runs. His 31 long balls in 94 games were the top per-game mark among Minor Leaguers with at least 30 homers, and the native of the Dominican Republic blasted at least seven in each of the first four months of the season before playing only eight games in August. His .550 slugging percentage was more than 100 points higher than his mark from 2016 or 2017, and his breakout campaign came after he totaled 15 homers in his first 418 Minor League games. "It's just impressive what he does, he has monster power," Picollo said. "The thing he does that most good power hitters do, he's not going to miss a hanging breaking ball. Can hit a good fastball. The area of the game that needs to continue to be addressed is chasing pitches. His aggressiveness, which we never want to take away, got the better of him at times. "From one year to the next, great amount of improvement. He's a good self-evaluator, and I think that's why his numbers jumped. Defensively, he's good, definitely a corner guy, can really throw and profiles great as a right fielder." Brewer Hicklen, Lexington (82 games), Wilmington (22 games): Hicklen began the season at extended spring training but had already jumped two levels to Class A Advanced Wilmington by July. His 35 stolen bases led all Royals full-season Minor Leaguers, and he hit 18 homers while his .378 OBP would have led the SAL with more at-bats. "He went to Lexington, started slow and starting pressing, but once he hit his stride he exploded," Picollo said. "Rare speed/power combo, and the good thing with Hicklen is that he gets that's what makes him a little different. He's a really good baserunner, defensively did a good job." A 2018 third-round pick out of UNLV, Isbel needed only 25 games in the Pioneer League to force his way to a full-season affiliate, and he batted .289/.345/.434 with three homers and 12 steals in 39 games with Lexington after posting a 1.063 OPS with Idaho Falls. His 30 runs scored out of the leadoff spot tied for 13th in the SAL during his time with the Legends, as the Royals' 14th-ranked prospect did a nice job setting the table. "We've only had a couple guys jump in their first year and make an impact the way he did -- Johnny Giovatella comes to mind," Picollo said. "He became the heartbeat and leader of a team. Kyle is the same, not a vocal leader but plays hard. Able to get on base without trying to do too much. Stepped right in, showed he can hit the other way, has power to the pull side and is an exceptional center fielder." Utility player -- Kort Peterson, Wilmington (62 games), Northwest Arkansas (50 games): Peterson improved each of the first three months to force his way to Double-A, where he hit seven homers and stole six bases in 50 games. He tailed off in August and batted .204/.295/.389 after a strong start with Northwest Arkansas, but his OPS topped .820 in every other month besides April, which was before he got going with the Blue Rocks. "Kort is a 'Steady Eddie' guy. Everyone knows what he can do. Not high-profile but goes out and does a job, similar to Nicky [Lopez]," Picollo said. "Knows his role, takes pride in his defense. Had a weird injury in 2017 with nerve damage in his shoulder [that] prohibited him from playing. One of those guys who was a little under the radar, but I thought our scouts did a good job getting him in the 23rd round [in 2016]. He just didn't have a great Draft year as a junior at UCLA." Right-handed starter -- Gerson Garabito, Wilmington (26 games, 26 starts): The 2018 season was a tale of two halves for Garabito, who went 2-5 with a 4.30 ERA in 13 first-half starts before dominating after the All-Star break with a 6-1 record and 2.15 ERA. He cut his walk rate and struck out more batters in the second half, and the 23-year-old seems likely to find himself in Double-A to start 2019. "He has a three-pitch mix, gets up to 95 mph at times and throws his breaking ball for strikes. He's very consistent with his breaking ball and has a changeup to complement," Picollo said. "Gerson has learned to pitch backwards, so his fastball plays up. I'd be lying if I didn't say I was expecting what happened in the second half to happen in the first. We expected him to be in Double-A by then, but altogether he had a really nice season." Left-handed starter -- Jake Kalish, Omaha (17 games, 14 starts), Northwest Arkansas (16 games, four starts): Kalish started the season in the Northwest Arkansas bullpen and never really hit his stride until moving into the rotation permanently in June. He went 6-6 with a 3.34 ERA and an 85-to-13 strikeout-to-walk ratio in 17 games, including 14 starts, with Omaha. And the 27-year-old maintained most of that strikeout rate upon leaving the bullpen. "Jake has always thrown strikes," Picollo noted. "Really smart and good competitor and has just learned how to use his breaking ball three different ways. Little slider, cutter over the back edge, swings and misses, called strikes. What stood out is his ability to use knowledge and feel to attack right-handers. He just found his stride and keeps getting better. Jake is extending his career and applying things he's learned over the years, and he's turned into a pretty effective pitcher for us." Relief pitcher -- Jake Newberry, Northwest Arkansas (25 games), Omaha (16 games): Newberry saved 12 games for the Naturals and had a 2.12 ERA and 37-to-8 strikeout-to-walk ratio over 29 2/3 innings before getting promoted to Omaha, where he shaved his ERA to 0.90 over 20 innings. His strikeout rate dipped, but the Royals still deemed him worthy of a bump to the Majors, where he was 2-0 with a 4.73 ERA in 13 1/3 innings. "Jake's another with an interesting background -- late-round pick, probably 83-84 mph first time I saw him pitch," Picollo said. "You wonder, 'Does he belong?' Jake has worked extremely hard on his body and mechanics, and his slider keeps getting better. He's been able to put some things together in a short period of time considering where he was, went to the bigs and impressed our Major League staff as well."